Childrens Patio, Bronze mounted on brick. Eeyore was installed September 15, 1991, Piglet was added May 11, 2013. Eeyore is 28" tall, Pooh is 49", and Piglet is 24". When asked to create a sculpture for the Childrens Patio at the Newton Free Library in memory of a 4 year old boy, I thought it appropriate to choose a character from childrens literature. I chose Eeyore because he is not only a lovable personage, but one from whom a very important lesson could be learned. When the day of his birthday came he was supposed to receive a hunny pot full of hunny, and a balloon. By the time his gifts arrived, the hunny pot was empty and the balloon was broken. Instead of being angry, he took the stick from the broken balloon and made a game of sticking the stick in and out of the hunny pot. Perhaps we can all learn a lesson from Eeyore. Piglet was commissioned by a woman who wanted to celebrate the short life of her dear brother. She thought her brother had characteristics just like Piglet. He was timid, yet brave and he was able to conquer his fears. Piglet and Pooh loved each other and were best friends. 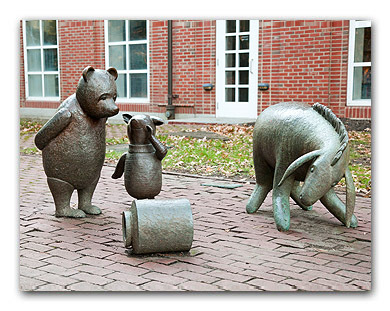 In the sculpture, Piglet is whispering a secret to Pooh. What that secret is, we will never know - because it is a secret! Dear Mayor Concannon, How would you feel if you were outside twenty-four hours a day, seven days a week, 365 days a year? You stood alone in the winter with the unfriendly snowflakes nipping at your back. There is no one to keep you warm, no one to talk to. Its just you and the snow. I am writing to you about a sad little donkey who lives around these parts. He goes by the name of Eeyore. You may have read about him in A.A. Milnes books and you may have read that he is a sad little donkey, but even sad donkeys need a friend, preferably Winnie-the-Pooh, every now and then. I believe it is time for that poor old donkey, who awaits very patiently by the Newton Public Library for his friend, to be giving a late (or early) birthday present: Winnie-the-Pooh. This may seem a little small and childish, but remember, everyone has a little Pooh-Bear in them! Im sure if a sculpture of Winnie-the-Pooh thumped along and came across Eeyore, that ol donkey will give the biggest smile youve ever seen. So, please consider giving Eeyore a friend. Sarah died on February 14, 2001. Her parents asked me to design a sculpture of Winnie-the-Pooh in her memory. I added a hunny pot for children to sit on, possibly to cheer Eeyore up. The sculpture was installed on May 12, 2002 with a plaque reading For The Children of Newton From Sarah Oliver.